Finding a college is a research project unto itself. If you're a student coming out of high school, it's likely that you'll eventually choose a college and/or degree with primarily traditional on-campus classes, as these are in the majority. However, if you're an adult student, a member of the military, or have some other life obligations that keep you from consistently attending class sessions in-person, then consider an online degree option. This goes a long way towards favoring your ability to complete a bachelor's degree while juggling the rest of your life. What makes an online college a top return on investment? This list highlights 25 schools ranked on institutional factors that collectively suggest "best return" value. Also considered are average early-career and mid-career salary, as reported in Payscale.com's bachelor's salary report. Payscale.com site users participate in an ongoing digital survey, and their responses are averaged for each college reported in the list. Linear - This is based on a data point that is typically (but not always) a percentage value. For example, "graduation rate" of a college is a percentage value from 0-100%. If this is a ranking factor worth a maximum of 20 points, then the original data values 0 to 100% are scaled linearly down to a range of 0 to 20 points. Scaled - This is typically based on a dollar return value (but not always) where a higher value is better. For example, number of undergrad applications, early-career or mid-career pay. If the ranking factor is worth a maximum of 20 points and the salary data for all schools is salary from, for example, $35K to $70K (for all colleges collectively), this data range is mapped down to a range of 0 to 20 points. Inverted scaled - This is typically based on a dollar value (but not always) where lower is better. For example, student/faculty ratio, net price or tuition values. This is similar to "scaled" ranking factors, but the data range is reversed first before mapping down to the points range. Netprice - This is the average yearly cost (affordability) per student at a given college whose yearly family income is between $0 and $48,000. Points are scored on an inverted scale, with lowest price = highest points. Payscale early career salary range - This is the average yearly salary (return on investment) at the early career stage (five years after) for a bachelor's degree graduate of a given college. Points are scored on a scaled basis, with highest pay = highest points. Payscale mid-career salary range - This is similar to early-career salary (return on investment), but at 10 years after graduation. Scaled rank: highest pay = highest points. In-state tuition and mandatory fees - Published cost (affordability) for in-state students. Points are calculated on an inverted scale (as for Netprice): lowest cost = highest points. Graduation rate - This is a relative measure of a college's worthiness, reflected by the percentage of undergrads who graduate within a standard timeframe (as defined by NCES.ed.gov). Points are scored on a linear scale: the higher the graduation rate, the more points awarded for this ranking factor. #applicants - This is a measure of popularity, which implies a given college as having a relatively higher return on investment. Out-of-state tuition and mandatory fees - Published cost (affordability) for out-of-state students. Points are calculated on an inverted scale (as for netprice and in-state tuition): lowest cost = highest points. %retention - This is the retention rate of full-time freshmen students, indicating overall "contentedness" with the college in their first year. Points are calculated on a linear scale, with higher percentage translating to higher points. Student-teacher ratio - This loosely measures the potential personal attention that students can receive from faculty. Points are calculated on an inverted scale: smaller ratio = higher points. Payscale salary info is used for bonus points. All public institutions listed in this series appeared in Payscale.com's college salary report. Some private (nonprofit) institutions did not appear in the report. In such cases, the median value of all salary data is calculated for each of early-career and mid-career pay. Such schools listed in the second half will be flagged as having a median salary, and receive fewer ranking points for these two factors. Only schools that have at least five bachelor's degree programs are listed, in order to be of interest to a broader range of readers. The more programs available, the wider the choices for students, should they decide to change majors after first year, or to decide when declaring their major. 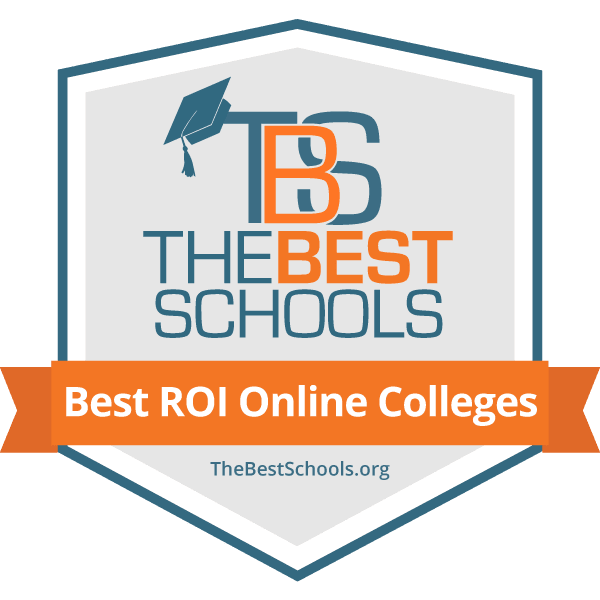 The data and ranking system details in the link above are shared with our 50 Public Colleges with the Best Return on Investment and 50 Private Colleges with the Best Return on Investment ranking articles. Additionally, colleges in this list offer at least *some* fully online bachelor's degrees and at least five "distance" bachelor's degrees, as reported in IPEDS Datacenter. Supplemented here are extra scoring points for the various online ranking factors, such as the percentage of undergrads taking either some or all courses online. Note: the Department of Education's IPEDS Datacenter reports the net price and tuition costs listed below, which are subject to change (when colleges report new data). While these data represent average costs across various topics, some colleges may vary their charges for classes taken online. Check each college's Web site for specific online degree tuition rates, or contact their admissions department. The University of Florida (UF) and UF Online currently provide undergrads with around 20 online bachelor's degree programs. Many of these are four-year offerings available fully online, although some may have in-person requirements, such as labs or clinical components. A few degrees are 2+2 options that require students to already have an associate's degree or at least 60 transferable credits. Among the wide array of choices available are the BA in Anthropology, BS in Business Administration, BA in Digital Arts and Sciences, BS in Health Education and Behavior, and BS in Telecommunication Media and Society. UF is not only one of the top public national universities in the country, its online bachelor's programs are also among America's best---20th best overall and 14th best for veterans, according to U.S. News & World Report. That means online students get access to the same academic quality and top-level faculty that on-campus students do. They just pay less for it. In-state, online students pay only about 60 percent of what in-state, on-campus students do in tuition and fees. Yet, online students still have access to what they will need to succeed. This includes academic advising and supports, career resources, library services, and service-learning and study-abroad opportunities. Undergrads at Embry-Riddle Aeronautical University-Worldwide (Embry-Riddle Worldwide) can choose from around a dozen distance or online bachelor's degree programs. Online undergraduate courses are available in 12 different, nine-week terms each year. (EagleVision/synchronous courses are available in five nine-week terms a year.) Some of the degrees Embry-Riddle Worldwide offers online include the BS in Aeronautics, BS in Aviation Business Administration, BS in Aviation Security, BS in Emergency Services, and BS in Engineering Technology. U.S. News & World Report currently ranks Embry-Riddle Worldwide's online bachelor's programs No. 1 overall in the country, and No. 1 for veterans. The university utilizes Canvas as its learning platform, which also facilitates student and faculty interactions. For synchronous classes, EagleVision Classroom and EagleVision Home supplement and expand the learning experience. These video conferencing technologies provide for a true virtual classroom, allowing students, faculty, and guest speakers---wherever they may be around the world---to collaborate and interact with one another in real-time. Some of the resources available to help Embry-Riddle Worldwide's online students succeed include academic advisors, alumni mentoring, career services, internships, and library services. Including majors that have two degree types, Pennsylvania State University (Penn State) offers more than 30 online bachelor's degree programs. Available through the Penn State World Campus, these online degrees provide the ability to gain an elite education without the need to be on campus. Among the wide selection of programs available are such unique choices as the BS in Biobehavioral Health, BD in Digital Multimedia Design, BA in Organizational Leadership, BS in Security and Risk Analysis, and BS in Turfgrass Science. U.S. News & World Report (USNWR) ranks Penn State one of the Top 15 public national universities in the country. Its online bachelor's programs, meanwhile, are also among the nation's best. USNWR ranks them eighth best overall (tie) and seventh best for veterans (tie). Taught through Canvas, the Penn State World Campus online programs allow for both independent study and collaborative learning. Most courses are asynchronous, allowing students to "attend" class when it fits their schedule (although, there are regular activity, assignment, and exam deadlines). Multiple communication options---such as bulletin boards, chat, email, social media, and video conferencing---ensure regular interaction with classmates and professors. Various activities and services provide the supports and connections online students need to succeed and feel part of the university community. Undergrads at Northern Arizona University (NAU) can select from about four-dozen online bachelor's degree programs (including specializations and those majors that have two degree types). Available through NAU-Extended Campuses, some online options are degree completions, while others are full programs. Every selection is available fully online, although some can be taken in a hybrid/blended format, if desired. Among the degrees available are such diverse choices as the BA in Communication Studies, BS in Computer Information Technology, BS in Hotel and Restaurant Management, BS in Parks and Recreation Management, and Bachelor of Social Work. Affordability is one of NAU's main strengths, especially for online, in-state students. Online, out-of-state students may qualify for reduced tuition costs through the World Wide University (WWU) tuition savings program. NAU uses Blackboard Learn as its course delivery system. Most courses are asynchronous, but all allow for interaction and discussion with teachers and classmates. Support is available in the form of library services, mobile apps, tech support, tutoring, and a variety of other resources. For those who prefer to study on their own---and their own timeline---NAU has a newer option in certain programs called Personalized Learning. This competency-based option provides additional cost-effectiveness and/or schedule flexibility. The University of Central Florida (UCF), through UCF Online, offers over two-dozen online bachelor's degree programs (including tracks/specializations and majors with two degree types). Offerings suit both adult students seeking to finish their degrees and traditional students just starting their education. (Some programs may have limited course selections or take longer to complete than comparable on-campus versions.) Among the more-intriguing degrees available are the BA in Communication and Conflict, BS in Health Informatics and Information Management, BA in Legal Studies, BA in Religion and Cultural Studies, and BS in Technical Education and Industry Training. In addition to being one of the Top 100 public national universities in the country, U.S. News & World Report ranks UCF's online bachelor's programs tied for 36th best overall and tied for 23rd best for veterans. In-state and out-of-state online students both pay less in tuition and fees than their on-campus counterparts---about 16 and 49 percent less, respectively. Classes are taught through a platform based on the Canvas learning management system (LMS), which also facilitates course interactions. Online students have a wealth of supports available to help them succeed. This includes academic resources, career services, experiential learning and internship opportunities, skills training, and student success coaches. Through its Virtual College, Fort Hays State University (FHSU) offers over 30 bachelor's degree programs. This includes majors with two degree types and some concentration choices. Among the unique program options available are the BS in Business Education--Training and Development, BBA in Management Information Systems, BA in Sociology--Addictions Counseling, BS in Technology Leadership, and BS in Tourism and Hospitality Management. Various programs are suitable for first-time students, transfer students, and/or those re-entering school to complete their degree. U.S. News & World Report ranks FHSU's online bachelor's programs in a tie for 15th best overall and 10th best for veterans, among any university in the country. The school has a particularly significant strength in the area of student engagement (which includes measures for best practices and graduation rates), but also demonstrates a high level of faculty credentials and training. On top of that, FHSU's Virtual College is known for its return on investment and affordability. Most online classes utilize Blackboard as their learning platform. Students access that, and their announcements, class schedules, email, online services, support, etc., through the TigerTracks portal and their own customizable home page. Some of the supports available for online students include career services, learning workshop videos, library services, a student engagement center, and tutoring. Through Ecampus, Oregon State University (OSU) provides undergrads with a choice of about 30 online bachelor's degree programs (including subjects that offer two degree types). The programs fit a variety of student types, although they are particularly well-suited to adult, military, and other non-traditional students. Some of the degrees students can select from include the BA in Business Administration; BS in Environmental Economics and Policy; BS in Fisheries and Wildlife Sciences; BS in Human Development and Family Sciences; and BA in Women, Gender, and Sexuality Studies. U.S. News & World Report ranks OSU one of the Top 75 best public national universities in the country. Its online bachelor's programs, meanwhile, are in a tie for 8th best overall and a tie for 7th best for veterans. OSU Ecampus's biggest strength may be the quality and training of its faculty. When it comes to tuition costs, online students all pay the same rate regardless of place of residence---there are no out-of-state fees. The learning platform Ecampus utilizes is the Canvas LMS. To help support its online students, OSU provides a number of resources, including career services, library services, student communities, success counseling, tech support, and tutoring. Undergrads at Florida International University (FIU) can choose from about 20 online bachelor's degree programs. Most programs available through FIU Online suit both first-time students and those looking to finish a degree. Each type of student can progress through their degree at the pace that suits them. The wide selection of degrees available include the BS in Criminal Justice, Bachelor of Health Services Administration, BBA in Human Resource Management, Bachelor in Public Administration, and BA in Sustainability and the Environment. According to U.S. News & World Report, FIU's online bachelor's programs are in a tie for 54th best overall and a tie for 32nd best for veterans. However, they are in a tie for second best in the country in the faculty credentials and training category. FIU Online utilizes Blackboard Learn as its classroom platform. A variety of software tools are available to further enhance each student's online learning experience. This includes Adobe Connect (web conferencing), NBC Learn (embeddable news content), ProctorU (online proctoring), and StudyMate Class (learning activities and self-assessments). Among the resources available to help online students succeed are alumni networking, career services, counseling, library services, student organizations, and tech support. The University of Massachusetts Lowell (UMass Lowell) currently offers six online bachelor's degree programs through its Division of Online & Continuing Education. These are the BS in Business Administration, BS in Criminal Justice, BA in English, BS in Information Technology (IT), Bachelor of Liberal Arts (BLA), and BA in Psychology. The IT program can also be taken as a second degree or with a Business Minor. The BLA is customizable, allowing students to select two concentrations from the nine available. Additional programs offering hybrid study are also offered. Most programs are suitable for both first-time students and those continuing their education. UMass Lowell is currently in the Top 80 public national universities in U.S. News & World Report's rankings. The publication also ranks the university's online bachelor's programs among the best in the country---54th best overall (tie) and 32nd best for veterans (tie). In the past, the division has also won several Online Learning Consortium/Sloan Consortium awards for excellence in online education and teaching. UMass Lowell utilizes Blackboard's LMS as its learning platform. Support services for online students include academic advising, career resources, library services, and tech support. Undergrads at the University of Alaska Fairbanks (UAF) can choose from seven online bachelor's degree programs. Four---the Bachelor of Business Administration, Bachelor of Emergency Management, BA in Justice, and BA in Psychology---are full four-year programs. The other three (the BA, BAAS, and BS in Interdisciplinary General Studies) are degree completion options. Courses are available during three semesters each academic year, but not all courses are available during each semester. Students, however, can take a mix of online and on-campus courses, if desired. Affordability and return on investment are two of the biggest strengths of UAF's online programs. They are a particularly good value for out-of-state students, who pay the in-state tuition rate. The eLearning & Distance Education division---which offers the best online programs in the state---is also known for the quality and training of its teachers. Faculty members, in fact, have access to a host of supports and training to ensure their course development skills, student engagement abilities, and technological competencies are always the best they can be. Classes are available through the Blackboard LMS and are asynchronous, but allow for interaction with fellow students and faculty. Resources and supports available to help students succeed include academic advisors, disadvantaged student services, library services, success modules, tutoring, and veteran services. The Oregon Institute of Technology (Oregon Tech) offers undergrads about a dozen online bachelor's degree programs. This comprises both full bachelor's degrees and degree completion options. Among the degrees available from both program sets are the BS in Applied Psychology, BS in Diagnostic Medical Sonography, BS in Echocardiography, BS in Information Technology (IT), and BAS in Technology and Management. Oregon Tech Online's courses are available four terms a year: three 10-week terms, and one eight-week summer semester. In addition to Oregon Tech being the top regional public college in the West (U.S. News & World Report), many rankings also rate the affordability and return on investment of the school and its online division very highly. This affordability and ROI extends to out-of-state students, as well, who pay resident tuition rates. Oregon Tech Online utilizes Blackboard Learn as its course delivery platform. This LMS houses assignments, discussion tools, instructions, and tests associated with each course. Most courses are asynchronous and have varying assignment deadlines. Others have set class times and may utilize the Blackboard Collaborate video conferencing solution. Teachers of both asynchronous and synchronous classes can use Collaborate for office hours, help, or special supplemental sessions, with recordings available for students unable to attend. The University of Texas of the Permian Basin (UTPB) offers about a dozen online bachelor's degree programs. This includes both four-year options and degree completions. Among the four-year programs, some majors are offered both as a traditional full-semester-length program and an eight-week accelerated format with six semesters a year. Most programs are available directly through UTPB, but a few are part of a collaborative offering with the University of Texas System's Online Consortium (UTOC). Some of the degrees available at UTPB include the BA in Communication, BA in Humanities, BS in Industrial Technology, BBA in Marketing, and BA in Sociology. U.S. News & World Report ranks UTPB's online bachelor's programs in a tie for 81st best in the nation and in a tie for 47th best for veterans. UTPB's online faculty have a variety of resources, supports, and training available to them. This helps ensure each instructor can create excellent learning experiences and each course has a more consistent level of quality. The Canvas learning management system (LMS) facilitates course delivery and classroom interaction. Students connect with classmates and faculty through such virtual means as content sharing, discussion forums, email, instant messaging, and video conferencing. Student success resources include academic advising, library services, tech support and training, and tutoring. Including areas of emphasis and concentrations, Park University offers undergrads the choice of about two-dozen bachelor's degree programs. This includes both degree completions and full degree programs. Each are offered in an eight-week accelerated format, five terms a year. Park's online programs fit all types of students, but are particularly well-suited to working adults and military personnel. Among the fairly wide selection of online degrees available are such choices as the BSE in Education Studies, BPA--Fire Service Management, BBA in International Business, BS in Military History, and BA in Organizational Communication. Park's online programs are known for their affordability, quality, return on investment, and value. Tuition rates are the same for all undergraduate students, regardless of state of residence (i.e., there are no out-of-state charges). Military personnel and veterans, however, are eligible for varying discounts. Canvas's LMS is Park's learning platform. It provides access to course content, enables communication with instructors, facilitates collaboration and interaction with classmates, and allows for submission of assignments and taking of quizzes. To help ensure the success of its online students, Park provides a range of services and support. This includes academic advising, behavioral intervention, career services, clubs and organizations, library services, tech support, and tutoring. With more than 40 online bachelor's degrees available (including state-specific options), National University (NU) provides the largest number of online bachelor's degree programs of almost any school on this best-return-on-investment list. Some of the unique offerings available are the BS in Clinical Laboratory Science, BS in Construction Engineering Technology, BA in Film Arts, BS in Homeland Security and Emergency Management, and BA in Sport Psychology. With National's one-course-a-month, year-round enrollment, students can not only finish their degrees more quickly, but also dedicate their energy and focus to a single subject at a time. NU's online bachelor's programs are among the best in the country and are particularly well-suited to military personnel. In fact, U.S. News & World Report ranks National's online bachelor's programs in a tie for 65th best for veterans. NU's tuition structure means all undergrads pay the same rate, regardless of state or country of residence. Classes are on the Blackboard Learn platform and feature lectures, multimedia presentations, and readings. Students connect and collaborate with professors and classmates through bulletin boards, content/application sharing, discussion threads, electronic whiteboards, and live chat sessions. To help online students succeed, National provides such key resources as concierge services, library services, mobile apps, personal advisors, tech support, and tutorials. Including concentrations, Old Dominion University (ODU) offers over 40 online bachelor's degree programs. Of these, more than 30 are degree completion options, while about nine are full degree programs. Among the full programs available at ODUOnline are the BS in Business Administration--Finance, BS in Computer Science, BS in Criminal Justice, BS in Industrial Technology--Occupational and Technical Studies, and BS in Psychology. Not all general education and lower-level courses are available online, so full degree programs may have limited course selections in the first two years. ODU is one of the top public national universities in the country. Additionally, U.S. News & World Report ranks its online bachelor's programs in a tie for 63rd best overall. ODUOnline's out-of-state students may benefit the most from its well-known affordability and value. Non-resident and international online students pay only about 10 percent more in tuition than what all in-state students pay. ODUOnline utilizes Blackboard Learn as its teaching platform. Courses are available in both asynchronous and synchronous formats. Tools such as chat and threaded discussions help foster communication for both delivery models. Some of the "success" resources ODU provides online students include the Lynda.com training library, online proctoring, a student success app, and web conferencing tools for group work and study sessions. Undergrads at the University of Louisiana at Monroe, through eULM, can select from over a dozen online bachelor's degree programs. Some of these are full programs, while others are degree completions. Among the variety of degrees available are such programs as the BS in Elementary Education, BA in Modern Languages--French, BS in Health Studies, BBA in Risk Management and Insurance, and BGS--Social Science. eULM is increasing the number of eight-week courses it offers. This will help accelerate a student's progress and provide for better academic focus and schedule flexibility. Affordability, quality, and return on investment are among eULM's biggest strengths. Additionally, U.S. News & World Report ranks eULM 40th best in the nation in the student services and technology category (half of which measures student indebtedness). In-state and out-of-state students pay the same tuition and fees. Students can also earn credit for prior experience and training, which not only helps improve affordability and value, but further accelerates one's progress. Courses are available through the Moodle LMS, which also facilitates student and faculty communication and collaboration. To help ensure eULM students succeed, the university provides a number of resources, including career services, innovative presentation software, library services, mobile apps, a study tool creator, and tech support. Utah State University (USU) offers undergrads about 10 online bachelor's degree programs (including secondary majors and majors with two degree types). Among the programs available through USU-Online are such selections as the BS in Agribusiness, BS in Communicative Disorders and Deaf Education, BA in Economics, BS in Family Life Studies, and BA in Psychology. Although USU-Online degrees can be completed fully online, not all courses are available in every semester. In addition to being one of the Top 125 public national universities in the country, U.S. News & World Report ranks USU's online bachelor's programs 14th best overall and ninth best for veterans. Canvas is USU's online learning system. It provides access to course content, allows students to submit assignments, and enables student-to-student and student-to-teacher contact through such online means as email and discussion forums. Among the services available to USU-Online students to help them achieve their goals are academic advising, career services, library services, student success webinars, tutoring, and veteran services. Columbia College (CC) offers its students the choice of almost three-dozen online bachelor's degree programs (including majors with two degree types). Some of the online bachelor's degrees available include the BA in American Studies, BS in Business Administration--Sports Management, BA in Human Services, BS in Management Information Systems, and BA in Political Science. Courses are available in an eight-week format, six sessions a year. Students generally take a maximum of two courses each session but can get permission to take three. Columbia College's on-campus and online programs are highly regarded for their affordability. This cost-effectiveness extends to out-of-state online students, who pay the same tuition rate as their in-state counterparts. Online military students get about a 14 percent discount. Desire2Learn (D2L) is CC's learning management system. Courses are asynchronous, allowing for flexible study times. However, assignments do have regular deadlines. Even though CC's online courses allow for more independence, the university's small class sizes ensure more personalized/one-on-one attention from instructors. To further help online students succeed, Columbia College provides a number of resources, including academic advisors, career services, library services, study-abroad opportunities, study resources, tech support, and tutoring. Undergrads at the University of Wisconsin Stout (UW-Stout) have around 10 online bachelor's degree programs to choose from (not including hybrid options). Two---the BS in Digital Marketing Technology and BS in Professional Communication and Emerging Media with a Concentration in Applied Communication---are full degrees. The others are degree completions. However, customized general education courses and other electives are available online. This can allow the first two years of courses required for entry into the degree completions to be completed online at UW-Stout. U.S. News & World Report ranks UW-Stout one of the Top 15 public regional universities in the Midwest. Its online bachelor's programs are in the Top 110 best among all universities. This includes being in the Top 65 in the faculty credentials and training category. To help further the abilities of its faculty members, UW-Stout provides a variety of ongoing training options and resources, including an upcoming six-course series. Students, meanwhile, can access their own array of support services, such as career services, counseling, library services, tech support, and tutoring. Desire2Learn (D2L) is the platform the university uses for course delivery. It also facilitates communication through chat sessions, discussion forums, and email. UNO's online bachelor's programs are among the best in the country---in a tie for 24th best overall and a tie for 16th best for veterans, according to U.S. News & World Report. Blackboard Learn provides the learning platform for UNO, but the university is doing a pilot project with Canvas. Blackboard is still the main content delivery system, but students using either LMS will have the full features and tech support they need to get the most out of each course. Among the supports available to help online students succeed are academic advising, library services, online file storage, tech support, tutorials, and web collaboration tools. The University of Memphis (UofM), through UofM Global, offers undergrads the choice of almost 20 online bachelor's degree programs (including concentrations). Some are degree completions, but most are full degree programs. Almost all of them provide students with a hybrid/blended study option. Among the range of programs available are such degrees as the BBA in Accounting, BA in African and African American Studies, BS in Health Studies--Healthcare Leadership, BA in Philosophy--Applied Ethics, and BA in Public Relations. Affordability, return on investment, and value are the biggest strengths associated with UofM Global---areas for which it has garnered high rankings. Non-resident students benefit from a tuition rate that is only about 14 percent higher than what residents pay. Prior learning assessment opportunities help further cost-effectiveness for all students, while accelerating progress. eCourseware, a branded version of the Desire2Learn LMS, provides the course delivery platform. It also facilitates classroom interaction and collaboration. Most classes are asynchronous, allowing students to study when it fits their schedule. To help ensure the success of its online students, UofM Global offers a number of resources, including academic advising, adult student services, career services, learning supports, library services, and tech support. Including options, North Dakota State University (NDSU) offers six online bachelor's degree programs. They are available through the Distance and Continuing Education program of the Office of Teaching and Learning. The degrees comprise the BS in Human Development and Family Science (with Options in Adult Development and Aging, Child and Adolescent Development, and Family Science); BS in Strategic Communication; BS in Sociology; and Bachelor of University Studies. Students taking on-campus degrees at NDSU can supplement their studies with online courses, converting many to basically a blended/hybrid option. NDSU is one of the top public national universities in the country. Its online programs, meanwhile, rank well for affordability, quality, and value, particularly within the state. Blackboard is the university's learning management system (LMS). It delivers course content and allows students to communicate and interact with classmates and instructors; post on blogs, discussion boards, and journals; submit assignments; and take tests. A variety of other technologies are available to help supplement the learning experience, including interactive whiteboards, mobile web conferencing, and multimedia tools. To help ensure the success of online students, NDSU provides resources such as academic advising, disability services, library services, and tutoring. Undergrads at the University of Missouri (Mizzou or MU), through Mizzou Online, can select from about eight online bachelor's degree programs. Many of these are available as full degree options. Some require prior college credits. Others recommend that students have at least some college experience. Among the full degrees available are such programs as the BS in Human Environmental Sciences with a Focus in Early Childhood Education in a Mobile Society, BES with an Interdepartmental Emphasis, BHS in Health Science, and BS in Hospitality Management. U.S. News & World Report ranks Mizzou in a tie for the 51st-best public national university in the country. Its online bachelor's programs do rank in the nation's top tier, but it is in the student services and technology category---where it ranks 25th---where MU really shines. Part of that category rank may be due to low student debt from good affordability and high rates of financial aid. The other parts may be the support services and technology it provides. Support includes academic advising, career services, counseling, library services, tech support, and tutoring. Technologically, the Blackboard LMS is the main delivery platform and is supplemented by software such as Tegrity Lecture Capture and Wimba Voice Tools to improve the learning experience. Including concentrations, and majors with multiple degree types, Eastern New Mexico University (ENMU) has more than 40 bachelor's degree program options. Offered with the Office of Distance Education and Outreach, many options are full degree programs. A number of others, however, are degree completions. Some of the programs available include the BBA in Applied Economics and Finance, BS in Aviation Science, BS in Electronics Engineering Technology, BA in Religion, and Bachelor of Social Work. ENMU is well known---and highly ranked---for its affordability and value. Online students who do not reside in the state and are taking six credit hours or less each semester qualify for in-state tuition rates (which are amongst the lowest in the region). The university utilizes two learning platforms for course delivery: Blackboard and Mediasite. Blackboard is the main LMS and facilitates communication and interaction with classmates and teachers. Mediasite is available within Blackboard and allows students to experience live videos of lectures, or access them on-demand at a later time. Some instructors supplement Mediasite with other software to allow for real-time interactions during the lecture. Resources available for online students include counseling, library services, tech support, and tutoring. Indiana State University (ISU) offers almost 20 online bachelor's degree programs. There are both full degree programs and degree completion options available, all of which are fully online. Traditional, adult, and military students will all find selections that suit their schedules and needs. Some of the array of programs on offer include the BS in Adult Career Education, BS in Criminology and Criminal Justice, BS in Human Resource Development, BS in Insurance and Risk Management, and BS in Management Information Systems (MIS). ISU's online programs are in the nation's top tier. Overall, the university ranks well for its affordability, community service, quality, and value. In regards to affordability among online students, those from out-of-state may be eligible for the resident online tuition rates. ISU uses the Blackboard LMS as its course delivery system. Dynamic and interactive tools such as Blackboard Collaborate and Tegrity Lecture Capture supplement the LMS and help improve the learning experience. ISU has a strong commitment to the success of its online students. This takes the form of a host of resources, including academic advisors, an answers and information center (Sycamore Express), career center, concierge services, library services, online proctoring, and time management tools.